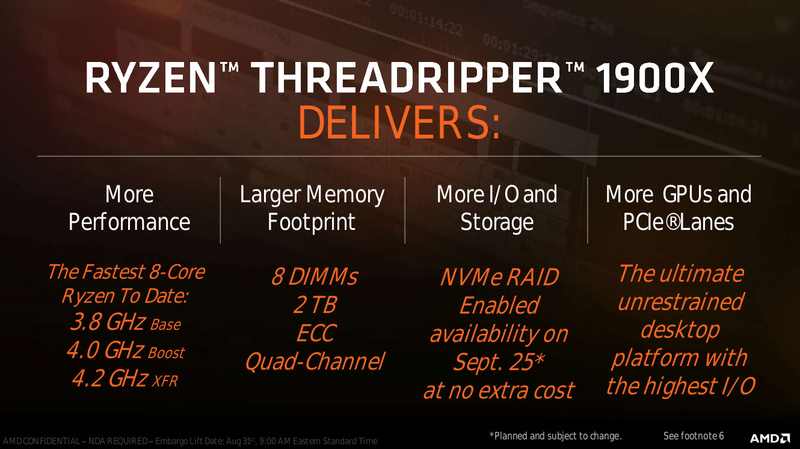 Today AMD’s long awaited 8 core Ryzen Threadripper 1900X will be available at retailers. 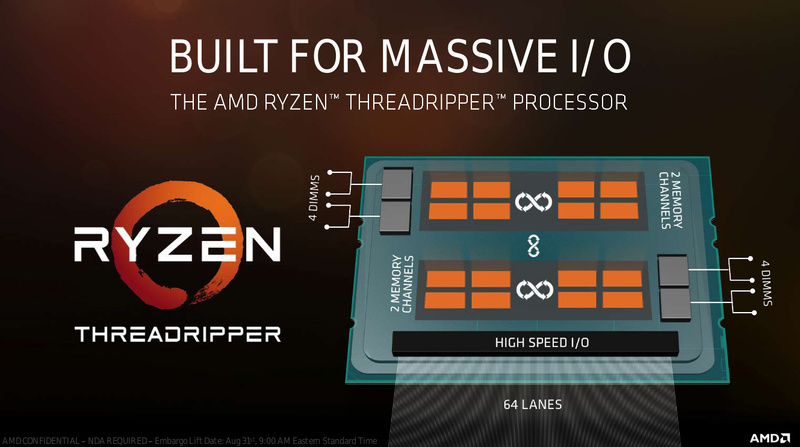 Like the other Threadripper chips that AMD has released the 1900X fits into AMD’s socket sTR4 and offers an all core boost clock speed of 4 Ghz, a four core XFR boost clock speed of 4.2 Ghz, all inside of a TDP of 180 Watts. 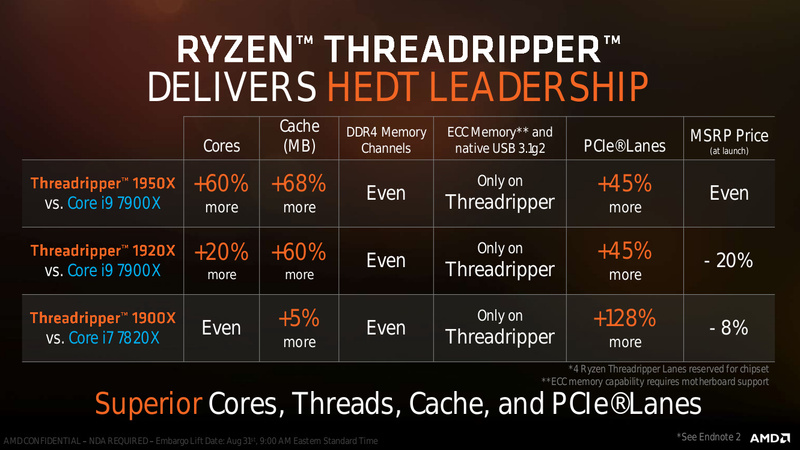 AMD’s Ryzen Threadripper chips are picked out in pairs from the top 5% of Ryzen dies. The base frequency on the 1900X is the highest of any Ryzen chip at 3.8 Ghz on all 8 cores. The 1900X is still a two die chip, but one CCX on each die is disabled. This means that the total amount of L3 cache available on the 1900X is the same as the 1800X at 16 MBs (20 MBs if you count in the L2s). Compare this to the Ryzen Threadripper 1950X which has 40 MBs of combined cache and it becomes easy to see that AMD really intends the 1900X a latency rather than throughput focused part. Of course the real appeal of the 1900X isn’t in the core count or cache sizes or clock speeds. Rather its in the massive I/O of the X399 platform and $549 entry point that the Ryzen Threadripper 1900X brings with it. Just like the more expensive Threadripper chips the 1900X offers all of the 60 PCI-E lanes, four memory channels with optional ECC, and extra USB ports that we’ve come to know with the 1950X. Thus if you were planning on building a Ryzen Threadripper rig for gaming the 1900X’s combination of high clock speeds, moderate core count, and expandability make it the best choice in the line up. More importantly there’s only a $50 price increase as you step up to the 1900X over the 1800X in the Ryzen price stack which means for most buyers in this price bracket it will be an easy up-sell. 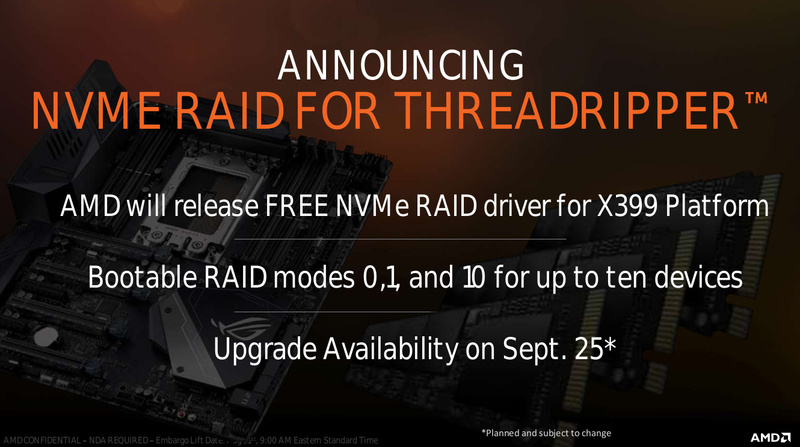 To demonstrate AMD’s continued commitment to the Ryzen Threadripper platform AMD is announcing that it will begin offering a driver for the X399 platform to enable NVMe RAID on September 25th. As it stands now none of AMD’s consumer platforms are capable of NVMe RAID. After the 25th of this month the X399 platform will offer RAID 0, 1, and 10 modes for NVMe devices. Right now this isn’t that big of a deal because very few people are putting NVMe drives in RAID configurations, but now that AMD is enabling it on X399 I would expect to see these kinds of configurations become more common. 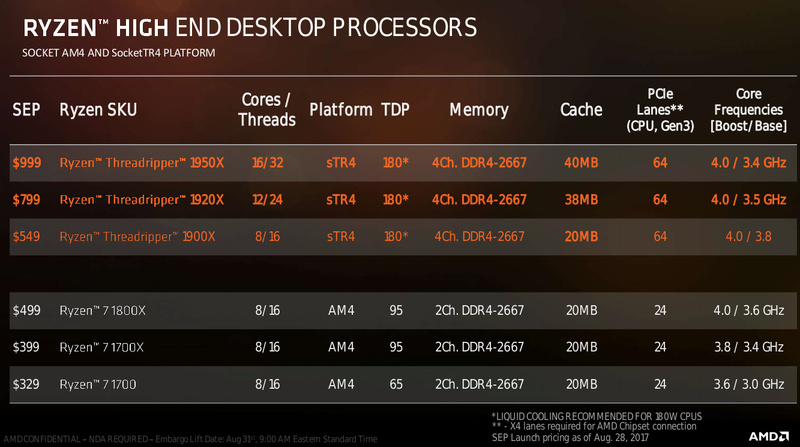 In terms of competitive positioning AMD is lining its Ryzen Threadripper 1900X up just below Intel’s 8 core Skylake-X chip the i7-7820X. While AMD hasn’t sampled us with a 1900X, Intel did send us a i7-7820X to included in our Threadripper 1920X review. Essentially what we found was that Intel’s Core i7-7820X offered surprisingly robust performance in multi-threaded apps, similar performance in games, and better performance in lightly threaded workloads than AMD’s Threadripper 1920X. Given how little the 1900X differs from the 1920X I would expect a comparison between these two 8 core parts to go in the same direction. The other big news coming out of AMD today is the availability of the complete Ryzen Pro lineup. This is the version of the consumer Ryzen product stack that is targeted at OEMs and businesses. Ryzen Pro branded systems should be making their way out to consumer anytime time now. In its press release AMD cited Ryzen Pro design wins in the Dell Optiplex 5055, HP EliteDesk 705, and Lenovo ThinkCentre M715 desktop PCs all of which are set to ship in the next few weeks. Interestingly AMD is also giving us the first tip-off about its upcoming mobile products by announcing that Lenovo will be shipping its ThinkPad A475 and A275 models with Ryzen Pro branded mobile processors in Q4. For the global launch AMD expects its Ryzen Pro mobile products to roll-out across the market in the first half of 2018.